iPhone 6: Apple BendGate truthers think media exaggerated new iphone 6 plus susceptibility to bending. Were news reports that the iPhone 6 is prone to bending actually a plot orchestrated by mainstream media? That’s what some Apple fans are starting to say after forensically analyzing the original video that broke the BendGate story. 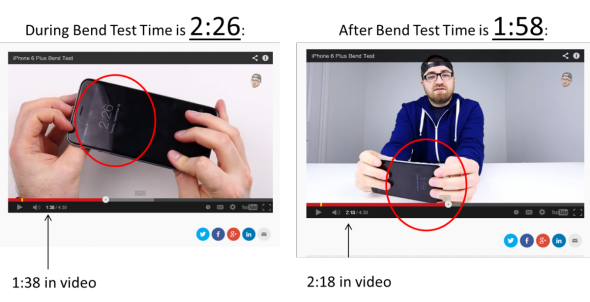 When he is bending it with his bare hands, the phone shows 2:26 p.m. Then, talking about it that later claiming it has bent as a consequence of his actions earlier in the video, the phone shows 1:58 p.m. Then later when he is summarizing, the time on the phone is 1:58 - 2:00 and has a bend in it. Then it shows 2 p.m. and the phone is straight with some possible damage near the volume button. 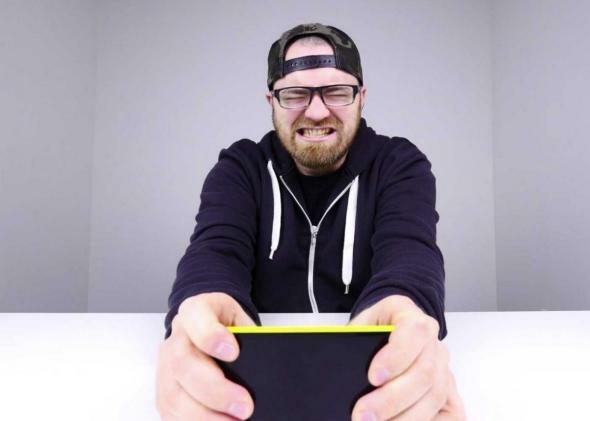 Canadian YouTuber user Unbox Therapy created the video, and Apple fans are beginning to accuse him of subterfuge to inflate just how bad the bending issue is. Reports had surfaced in 2012 that said the iPhone 5 was susceptible to a similar kind of bending as the iPhone 6 Plus. However, the issue didn’t gain anywhere near as much attention as the current controversy. Apple has weighed in on BendGate in a decisive manner. On Thursday the company revealed how it puts devices through a number of stress tests, allowing CNBC to film the company’s testing facility.